The Greater London area is home to some of the most congested airspace anywhere in the world, being surrounded by a number of major airports. The Docklands area is itself home to one of London's most important airports - London City. Normally this small commuter airport is kept busy with a few airlines offering city centre to city centre travel. Later in the year, British Airways will offer it's first transatlantic service utilising the small Airbus A318. A city airport can cause all kinds of environmental and social issues for the surrounding population and London City airport have a very positive outlook on keeping good relations with the community it serves, supporting several local charities, events and schemes. 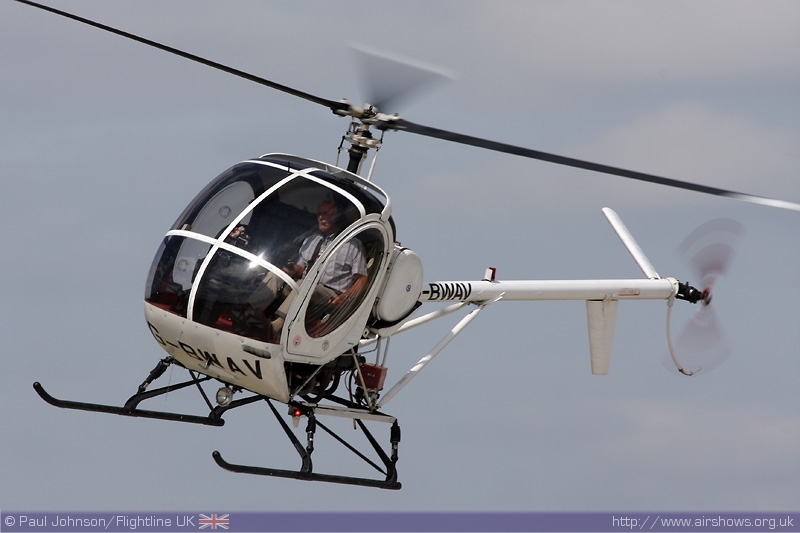 It also opens its doors each year to the local population with it's free annual Funday which includes a small flying display which helps raise money for local charities. 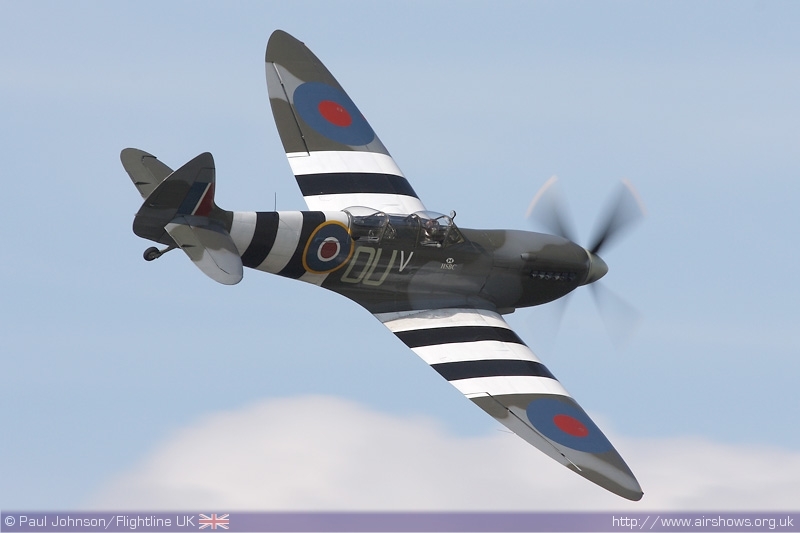 Paul Johnson/Flightline UK reports from London's only airshow of the year. Photography copyright of the Author. 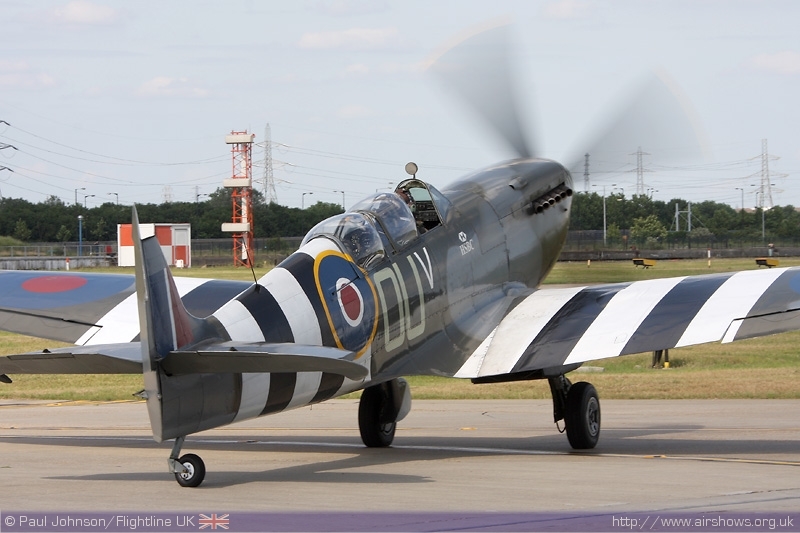 Situated just six miles outside the City of London, London City airport is a unique place for an airshow. Much of the capital is subject to stringent rules regarded who and what can fly over the City. The proximity of other major airports such as Heathrow, Gatwick and Stanstead also makes the airspace congested. The airspace around London City airport is controlled airspace, classified as "Class D". 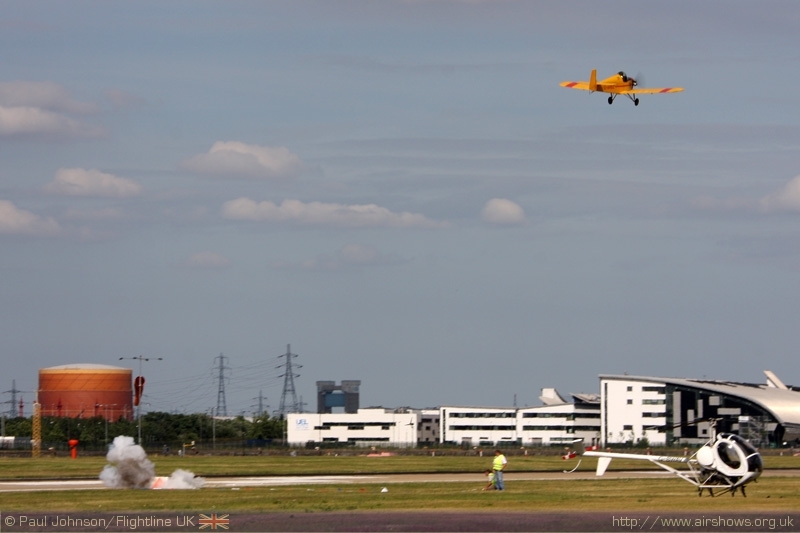 The London City Airport Funday is the only airshow in the UK held within Class D airspace. The Funday is run once the airport has shutdown on Saturday afternoon. Essentially, the show has to be prepared, opened, run and closed within a fairly short window so as not to impact on normal airport operations. 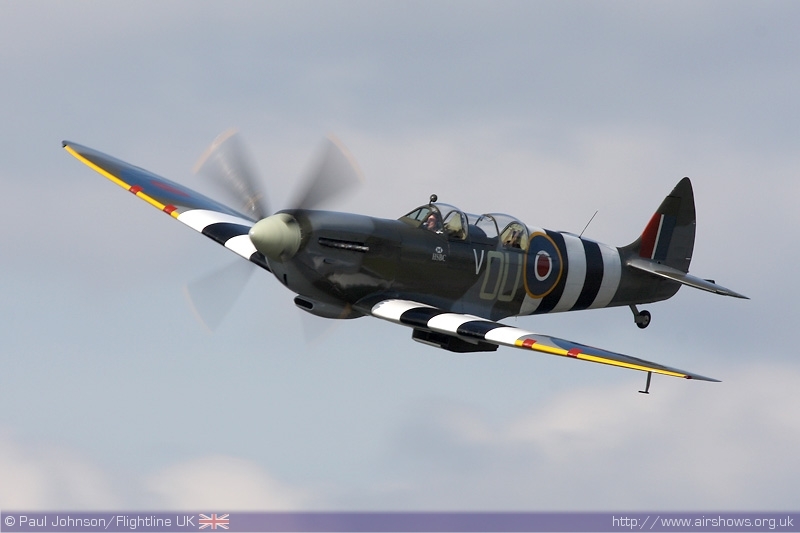 Infact, the event is not open to the public until 2.30pm which makes it quite different to other airshows! 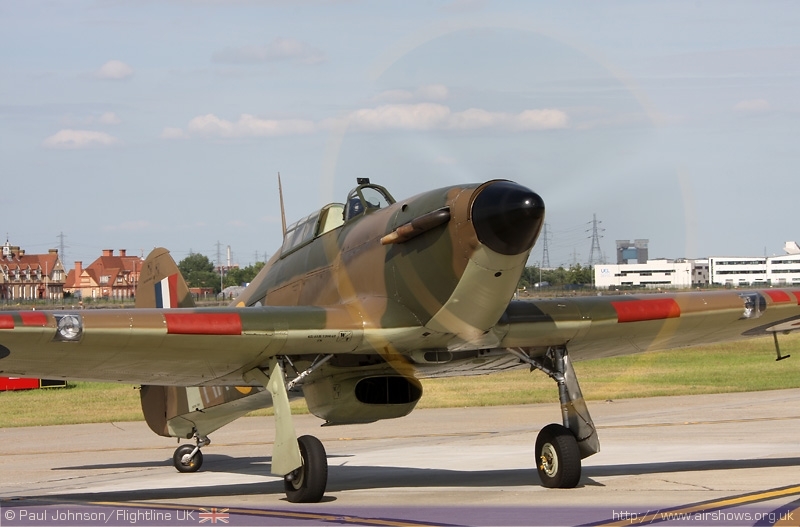 Once inside, the whole event has a very different feel than a traditional airshow with plenty of things to see and do, mainly centred around the local areas of London. British Airways had a BAE 146 open for people to visit and they invited children to have a go at being Cabin Crew! There was also a rich diversity of food on offer with everything from Indian to Carribbean delicacies to settle the taste buds! The flying display itself was split into two 45 minute "performances." One of the first things that came to mind looking at the line-up was some of the old Tiger Club displays at Redhill and Headcorn. While the display may have not been the largest of year, it certainly had all the entertainment you could wish for in a flying display boosted by the ever amusing commentary of Brendan O'Brien which really suited the atmosphere of the day. 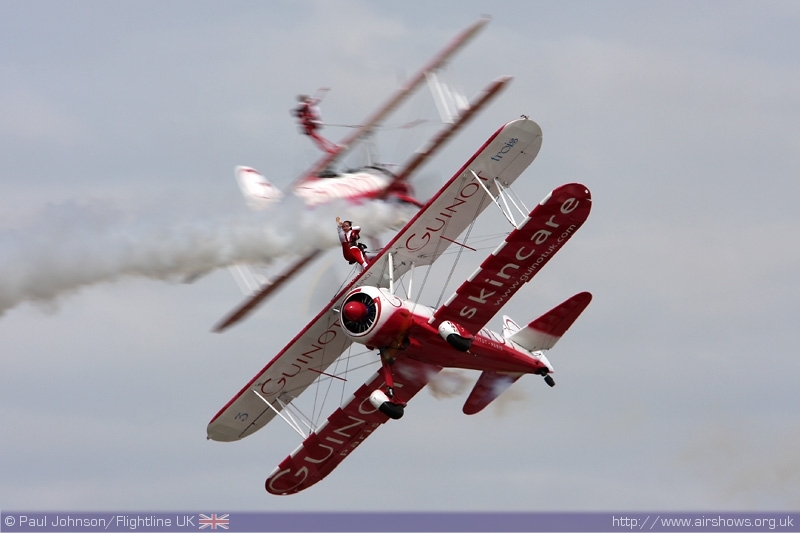 The displays opened with perhaps one of best known acts on the display circuit, Team Guinot. 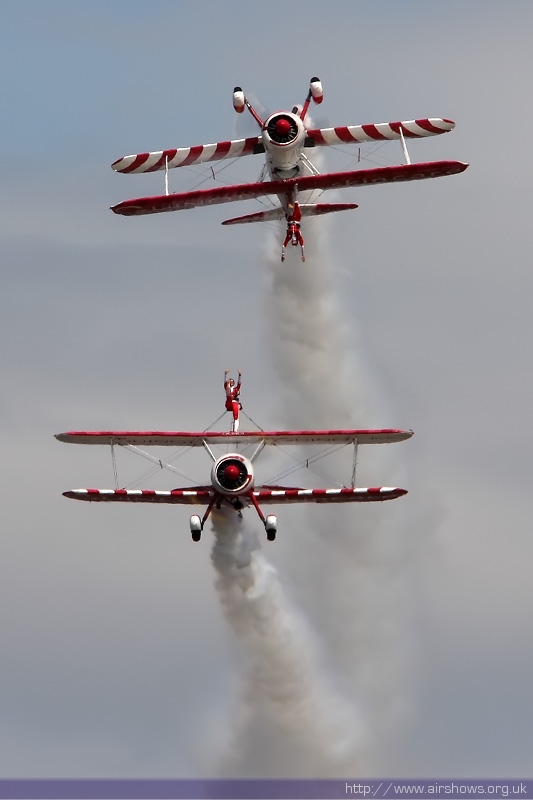 The team are always one to watch, but at a small venue like London City they really excel with all the noise and smoke as well as the glamourous wingwalkers. 2009 will be the last season for the team under Guinot sponsorship and the team are currently on the hunt for a new lead sponsor for 2010. 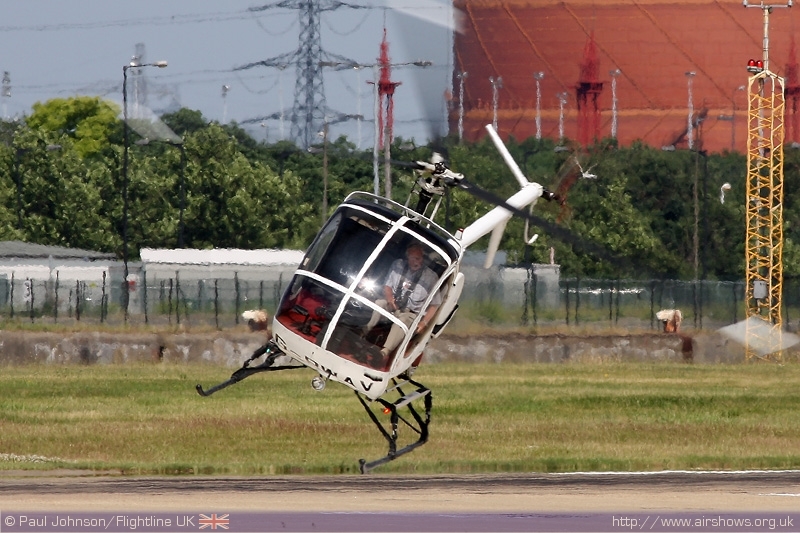 A real treat for the London City crowd was the return of one the real legends of the UK airshow circuit; Dennis Kenyon in his Schweizer 300C helicopter.. Dennis is a well known and respected pilot having won the World Helicopter Championships and flown sequences for some of biggest hollywood movies such as "Black Hawk Down." 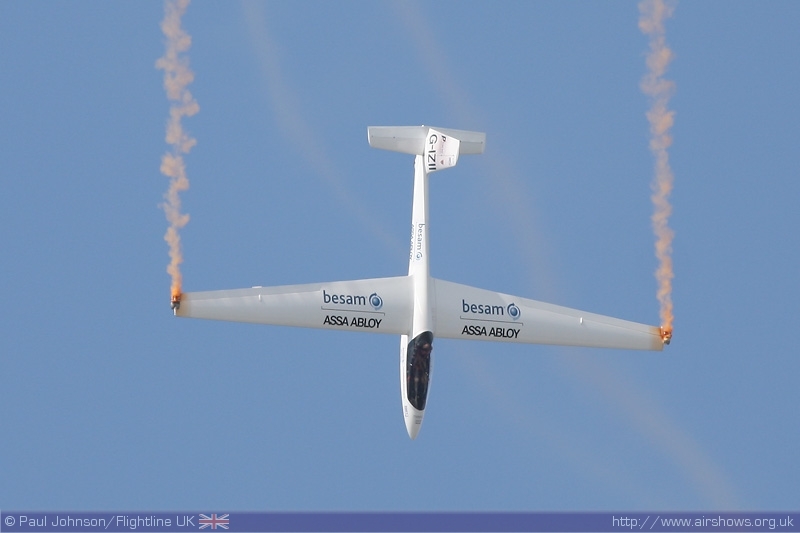 However, last year he was very lucky to walk away from an accident he suffered during a display practice in the US However, despite threatening to retire on more than one occaion, Dennis has returned to display flying with his brilliant dizziness-inducing display! 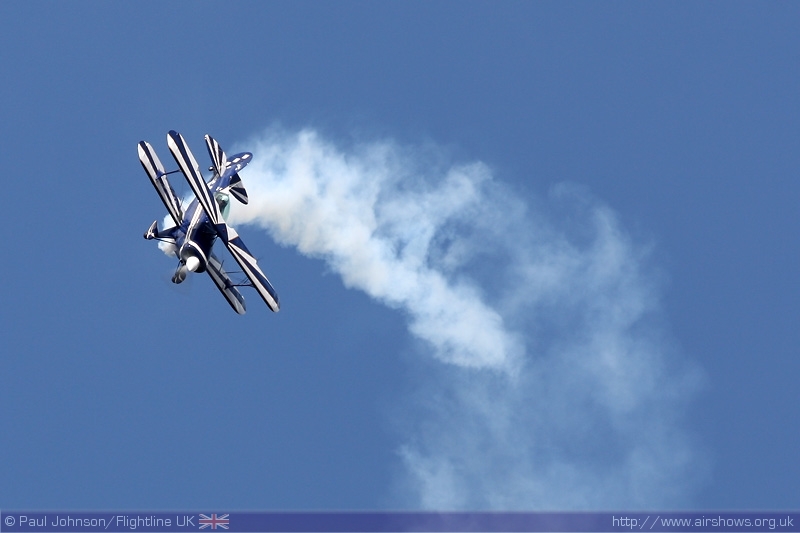 I personally hope a few more airshows can secure his display. 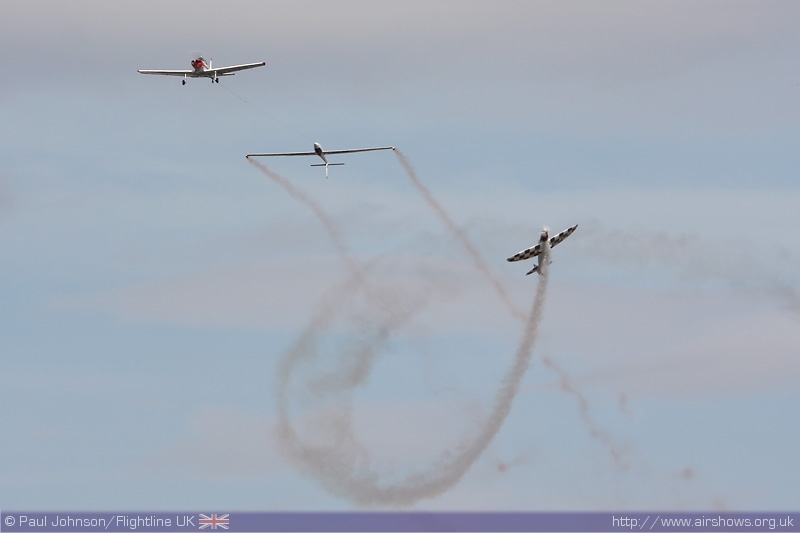 There were a multitude of aerobatic acts in the flying display. 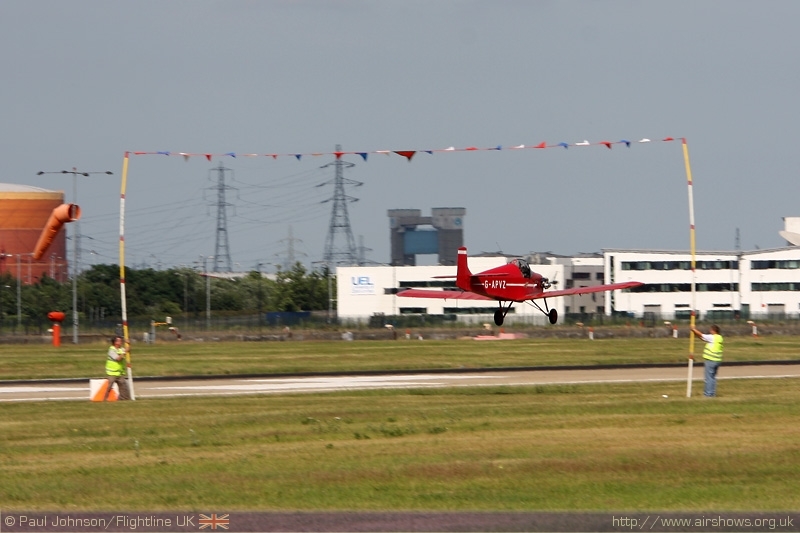 Paul Ambrose flew a pleasing routine in his Pitts S-2B Special. 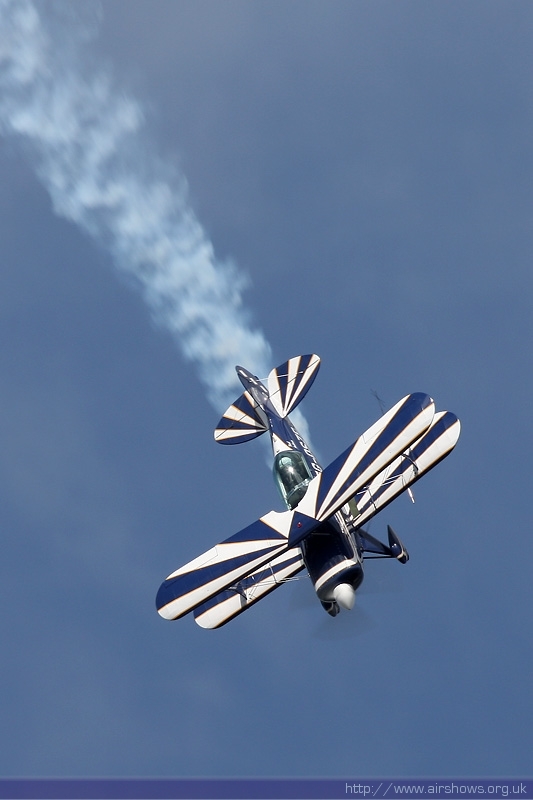 Pitts displays seem to have become some of a rareity on the display circuit which is such a shame for an iconic aircraft which is always a crowd pleaser. 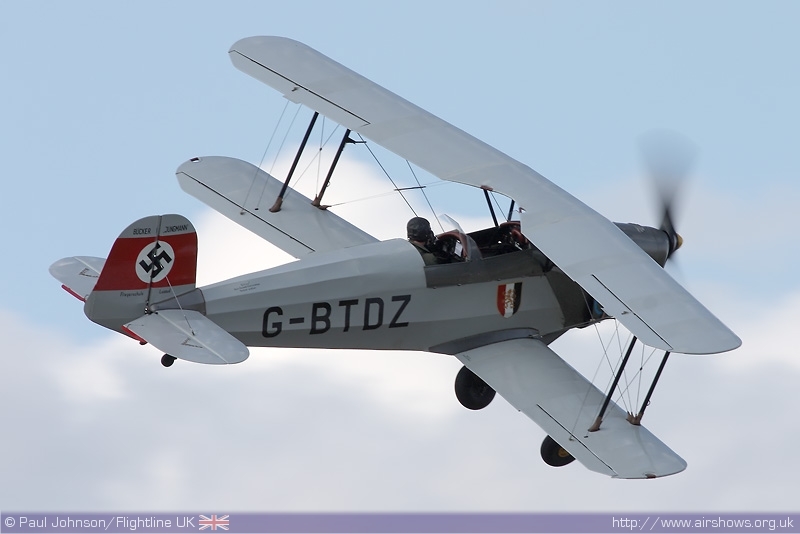 Michael Pickin gave a much more gentle display in his Bucker Jungmann which is normally based with the Tiger Club at Headcorn. Michael's display was a replacement for Richard Pickin's (Michael''s father) display in the CAP 232 which unfortunatly was unservicable. 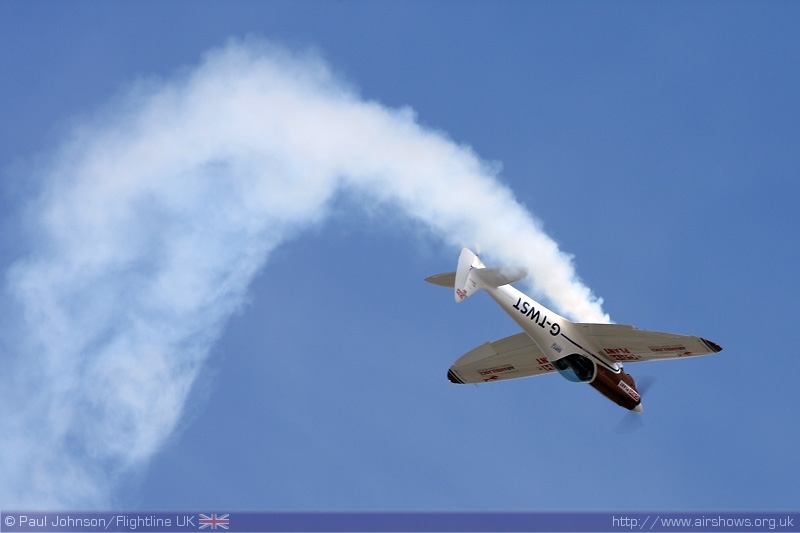 Pete Kynsey flew his Cosmic Wind racer through an exciting display of aerobatics. 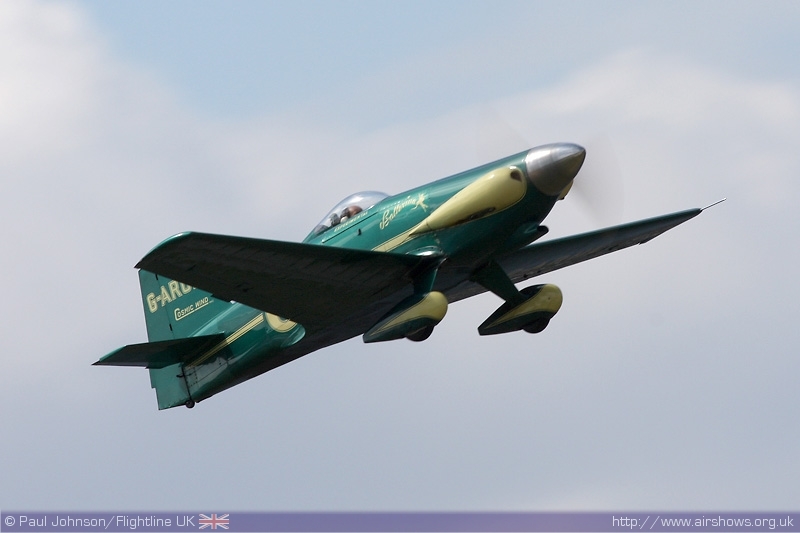 This little machine has a fascinating history having started life as a racing aircraft. 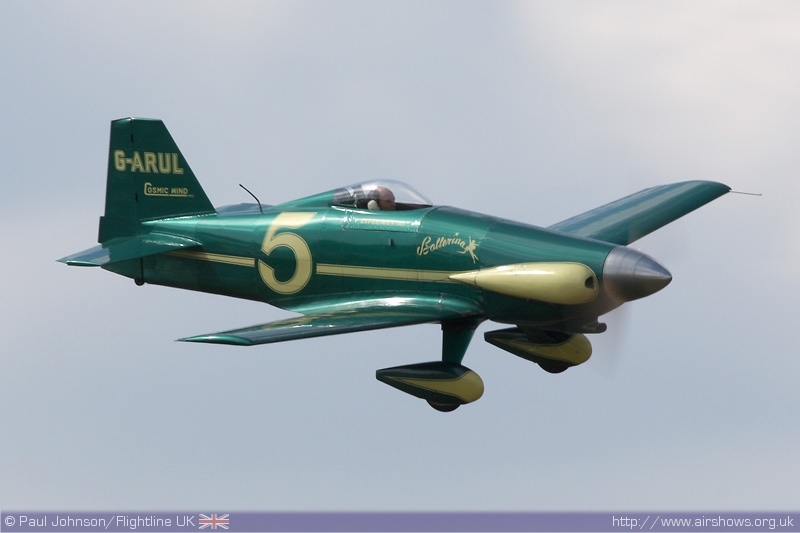 It then found itsself in the hands of the late Neil Williams at the 1964 World Aerobatic Championships before being 'retired" into the air display world. 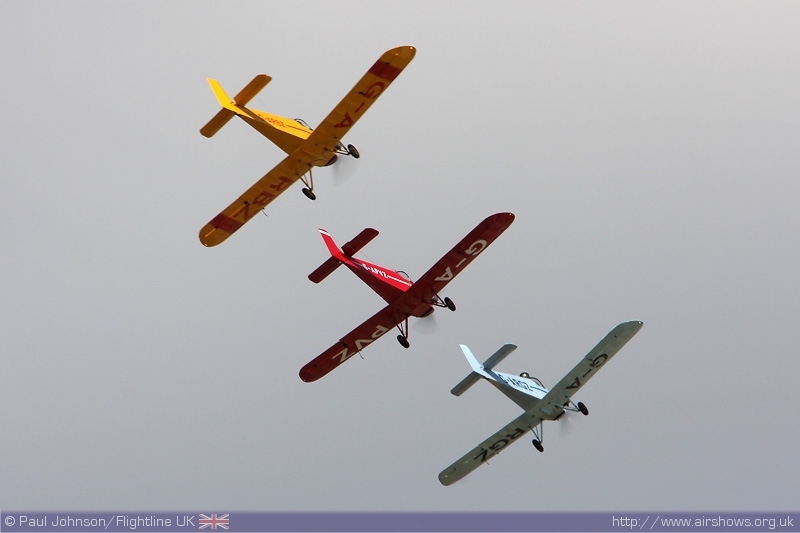 The Swift Aerobatic Display Team also appeared at Funday with their unusual display of powered and unpowered aerobatics. A small difference for their display was the Supermunk tow aircraft instead of the more usual Pawnee but as ever, the solos by the Twister and Swift were first class. Rounding off the barnstorming style of displays were the Tiger Club Turbulent Team who performed their usual mix of flour bombing, limbo flying and balloon bursting. The climax to the day's flying were displays from much heavier metal. 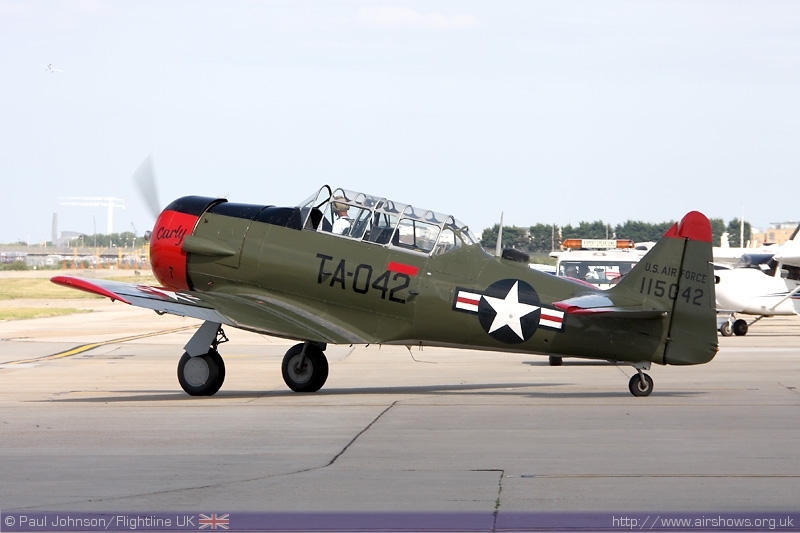 This was kicked off by the T-6 Texan belonging to Chris Bellhouse and again based at Headcorn. 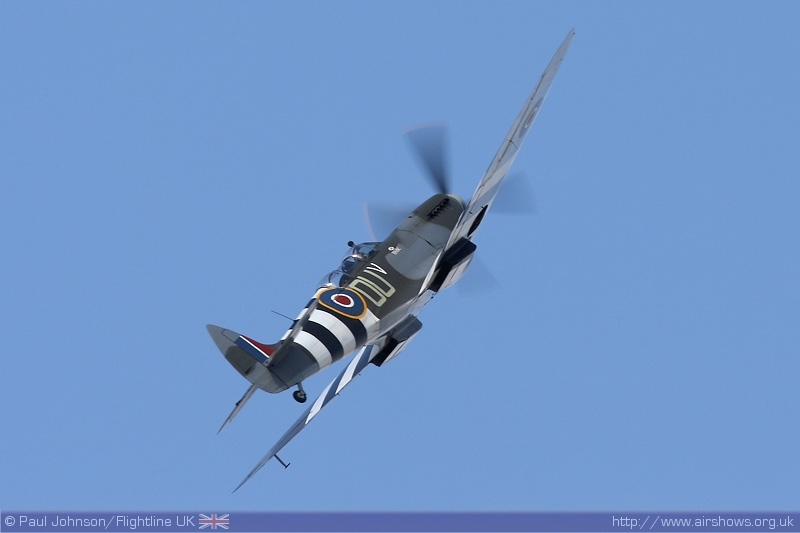 The display was flown by Tony Richards and included some lovely swooping aerobatics and low passes. The final two displays together were something truly unique. 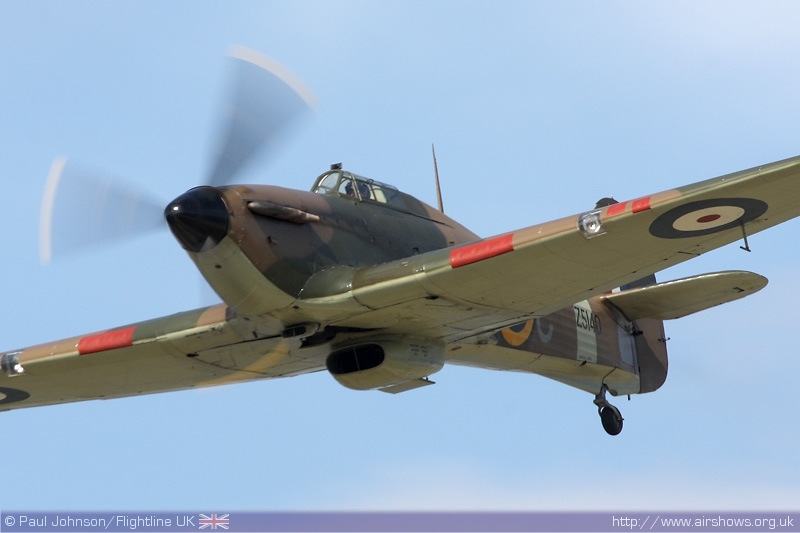 Anna Walker made a her display debut flying the Historic Aircraft Collection's Hurricane XII. 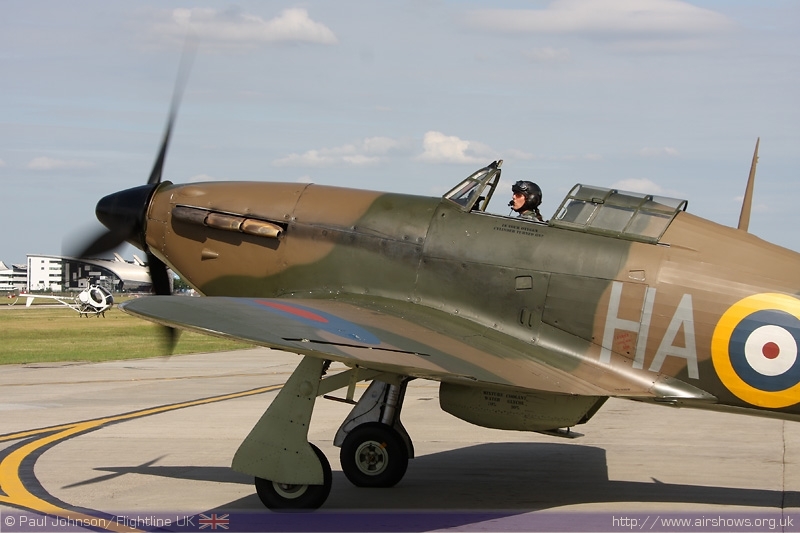 Anna is possibly the first female pilot to fly a Hurricane since the Air Transport Auxillary last ferried the type in 1945. 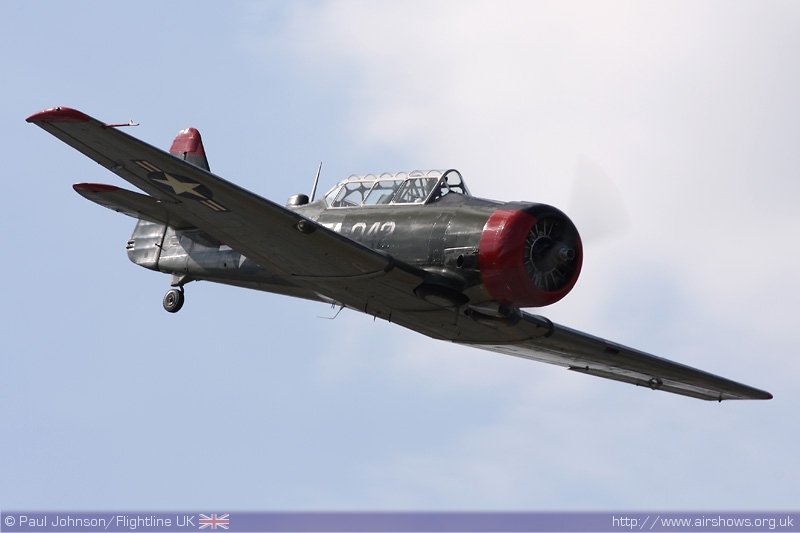 It is not the only warbird Anna flies. 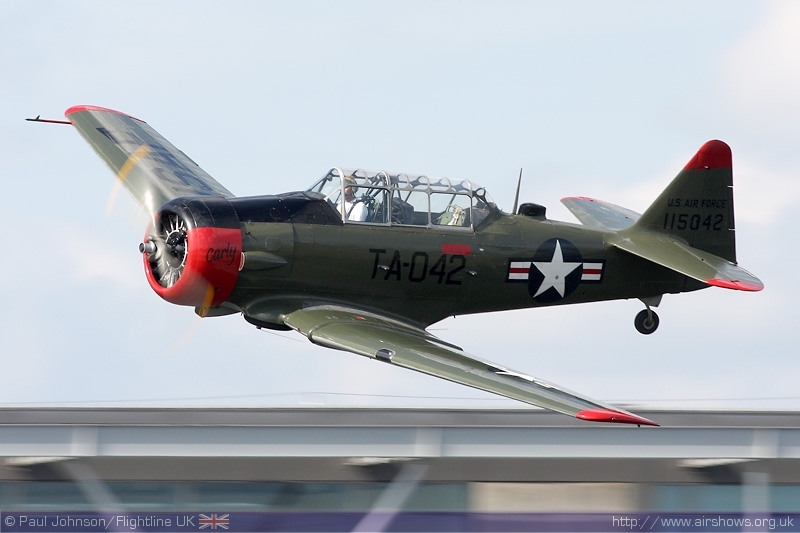 She regular flies T-6 Texans, the Scandinavian Historic Flight's P-51D Mustang as well as her own Jungmann and the Beech Staggerwing. The final act of the afternoon was Carolyn Grace in her Spitfire IXT making a unique duo of warbird displays flown by female display pilots. 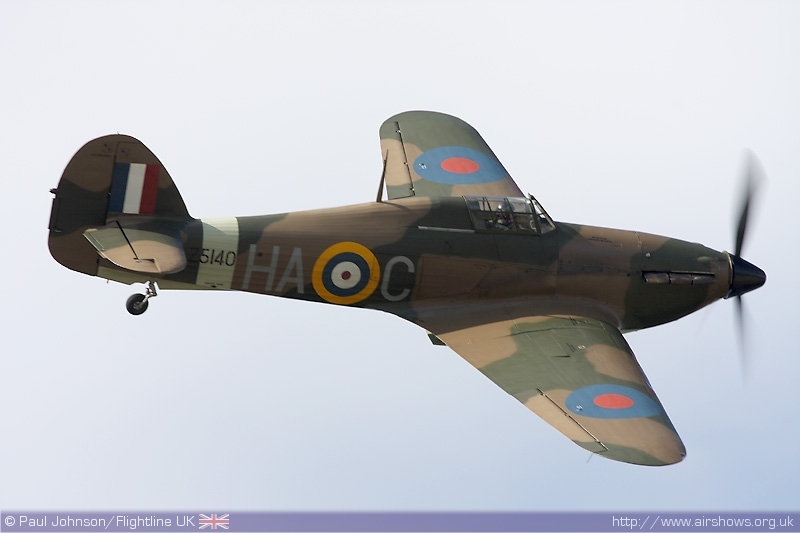 One of the unique things about the Funday is that it possibly the only chance you have to see warbird twisting and turning over the London skyline during the airshow season which is quite an emotive sight. The London City Airport funday may not be very high up on enthusiast "to-do" lists but I feel the show really is one of the hidden gems. Free entry and a unique "festival"atmosphere along with some very fine displays made the Fun Day a hugely enjoyable afternoon out in East London.